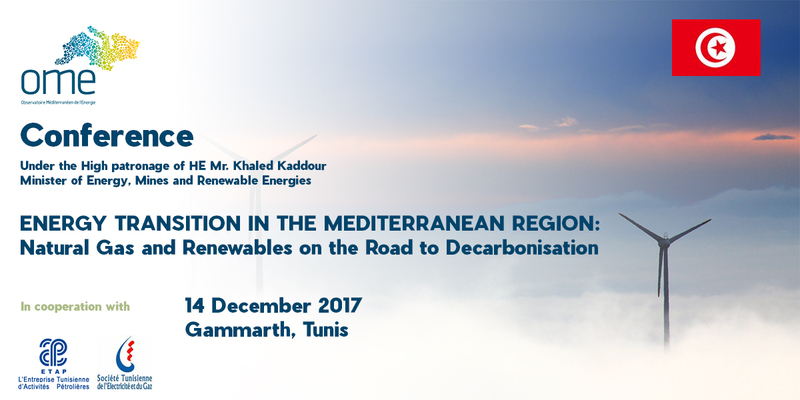 Under the high patronage of HE Mr. Khaled Kaddour, Tunisian Minister of Energy, Mines and Renewable Energy, OME organizes jointly with ETAP and STEG its 2017 annual conference to discuss the most critical issues of the energy transition in the Mediterranean region by looking at the role of renewable energies and natural gas in the aftermath of the Paris Agreement. The interaction between natural gas and renewable energies will be analysed also in relation to other flexibility options such as network infrastructure (particularly cross-border interconnections), smart grids, demand side measures and energy storage technologies. The objective is to identify the challenges, how to overcome them, and show benefits in terms of sustainability, affordability and reliability as well as business opportunities. In this regard, the main purposes of the event consist in: (i) developing a shared vision, assessing benefits of the combined development of natural gas and renewables towards an effective decarbonisation; (ii) identifying adequate financial support mechanisms and regulatory measures and promote a fair share of benefits within an investment friendly framework; (iii) analysing technical, economic and environmental issues in order to evaluate costs and benefits of investments in a comprehensive way, taking into account new gas discoveries and potential in the region, as well as technological progress in low carbon technologies. We believe that this conference will be a unique opportunity for intense views sharing and exchange.